It’s mid-winter break and there are lots of students out and about in The Junction. If you are planning on crossing the street at the designated crosswalks, you will now see orange flags located in stainless steel buckets at these two crosswalk locations. The south crosswalk runs between Elliott Bay Brewery and Husky Deli and the north crosswalk runs between Capers and Windermere Real Estate. 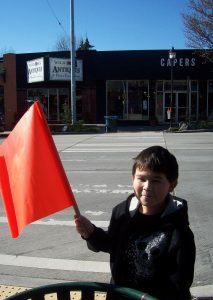 We encourage all pedestrians to use these flags when crossing the street as an added safety precaution. Stay safe out there while enjoying this beautiful weather!